Have you ever wondered what would happen if you took your kids on a cruise with you? Would they eat the food or is there even food they would like? What happens when you travel with food allergies? 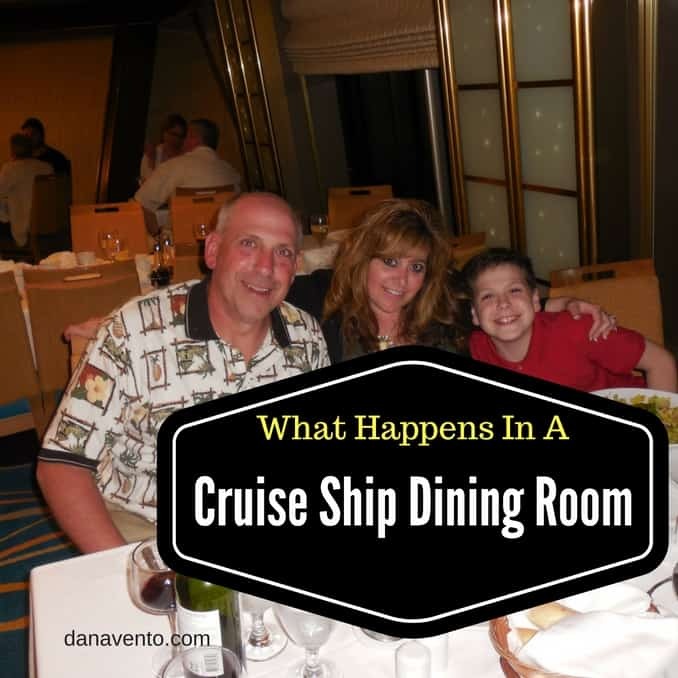 What happens in a cruise ship dining room? My father-in-law was quite intrigued with the wines, my kids loved the appetizers, and I just loved not having to cook. Some of the best entertainment is inside of the dining room and some people never experience this. You don’t have to get over-dressed, just presentable. The staff is amazing and once you get to know them and they get to know you, you never have to ask for a particular appetizer again, because they are ON it! Our youngest as you know has life-threatening food allergies and we did not want to be the cause of the ship stopping, so we worked with the Cruise ship ahead of time and when we boarded to get his meals allergen friendly. Lavishly live the travel tale of what happens in a cruise ship dining room out loud! We never worried once we set sail because the Head Chef, his staff and our servers worked nonstop to ensure Niko’s safety. It’s all good and we love to cruise because of this. Our worries were honest concerns as we had no idea if he could eat or what would happen and how we would be able to safely plan his meals. Often, his allergies deter us from eating in many establishments because many can accommodate, but choose to not. The difference on this particular cruise line was their willingness to address and tackle the food allergies so he could eat. Here is how our son with food allergies dined and had fun doing so when on a recent cruise! For this particular segment that I filmed, our son was being served lots of great foods that the CHEF felt would be totally kid appropriate, but being a true kid(and a bit of a stinker), our son did not want to leave his comfort zone of foods known. Senvil, who had talent far beyond meal service rocked our table with fun, humor and a family fun adventure each night as you can see in this video. This night, Senvil ‘tricked’ Niko into eating pudding by moving it all around his mouth and getting his mouth dirty. We all had a good laugh on this. The kids waited for the tricks, the skill and the awe of being inspired each night and never saw it coming. Our service staff was nothing short of amazing and if you want to know all about dining on this cruise ship with allergies make sure to read on into my other articles all about Which Cruise Line Offers Dining Options For Kids With Allergies? Learn all about dining with food allergies on the Lido Deck here. We had so much fun and you can tell from the video, because we lavishly lived food, and dining out loud while traveling and cruising. These are my opinions, yours may differ. We were provided a cruise in exchange of my honest opinions. Yep total kudos to Carnival .. they were ON his food allergies the whole time.. We were so blessed.. I have never had a chance to be in a cruise before, but hoping I could make it sometime soon with my kids. Food allergies are always scary, particularly when you have to deal with kids and it is good when they give allergy free foods to make the journey a smoother one! Ughhhh dinning with allergies can be tough! My cousin can’t have nuts and omg, every time I dine out with her it’s a struggle to make sure she eats safe foods. I have always wanted to go on a cruise. I think it would be fun for the whole family. I love to see more allergy friendly foods too. I can only imagine the struggle that you have to go through when you have allergies and you’re traveling. Which is why it’s awesome that there are cruise lines that are so accommodating that they would go out of their way to cook food for you! Your son is lucky! Good to see you guys enjoying as well! It’s tough to travel when you have allergies, that’s really something that concerns a lot of parents especially when it comes to cruises because you don’t have a lot of options. I think it’s great that the chef of this cruise line adjusted for your son’s needs! It’s good to know they are so accommodating! I’d be so happy not having to worry about cooking or finding a restaurant on this cruise. I loved getting an inside look at your dining experience! I love how flexible they were with your needs. My fiance and I are planning to take a cruise next year and I can’t wait! I didn’t realize that some cruise lines offers dining options for kids with allergies. I haven’t tried taking the grands on a cruise yet but when I do, I’ll be sure to see which one is right for their needs. I still think of the Love Boat when I hear the term Lido Deck. Lol. I’m glad to see cruises are considering food allergies, especially since they are so prevalent today. Cindy Ingalls recently posted..bluestem™ Oral Care for Pets!